Abby Wambach is the most prolific scorer in the history of women’s soccer. 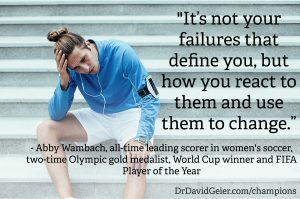 Not only did she score 184 goals in her career, she is a two-time Olympic gold medalist, winner of the 2015 Women’s World Cup and FIFA Player of the Year. Like everyone, though, she had to work her way up to the top level of her sport. Abby joined the US Women’s National Team while the legends of the 1999 World Cup-winning side were still on the squad. One of those legends in particular – Mia Hamm – played a significant role in her development. Abby’s first game with the national team came in a friendly against Germany. She came on as a substitute late in the game. She played for a total of 18 minutes. For every one of those 18 minutes, Mia Hamm was in her ear. “Where was I going? Why wasn’t I moving? What the hell was I doing?” Wambach recalled Hamm screaming at her. After the match, Mia told Wambach that she believed she could handle the criticism. Before the start of the upcoming WUSA season, Hamm underwent knee surgery. Even though Mia couldn’t play, she attended every practice and match. She yelled at Wambach to drop her shoulder when she shot instead of leaning back too much. As Abby came off the field, Hamm always suggested ways the young forward could improve. Abby listen to Mia’s criticism and took her advice. By the end of that season, she earned WUSA Rookie of the Year honors. As we climb the ranks in our professions, whether we work in medicine, law, sales or any other field, we are going to feel some degree of satisfaction. It’s easy to think we know everything. It’s easy to only hear the praise and dismiss the criticism. That criticism, though, can often be what makes us better. Abby Wambach could have ignored Mia Hamm’s criticism. Abby was clearly talented. She made the national team, after all. She could have dismissed Hamm’s suggestions, thinking that a player at the end of her career couldn’t teach her anything. Abby didn’t do it. She listened to every word, and she implemented the advice. She sought out constructive criticism to make herself better. And the results prove that the feedback helped. If your boss or coworker offers you feedback on your performance, how do you respond? Do you get angry? Do you tune it out? Or do you listen and accept it? When we face criticism at work, we often resent it. Even though it hurts, we need to listen carefully. We need to find the one suggestion, or many, that could help us perform better and ultimately succeed. As strange as it may sound, we also need to actively seek this kind of criticism. It does little good to surround ourselves with people who constantly tell us how great we are. We must find coaches, trainers or even coworkers further ahead in their careers than us and seek out their feedback. Honest feedback, even if some of it is negative, can propel us to new heights – if we listen and take steps to improve. Episode 364: What are the best ways to start a workout program?